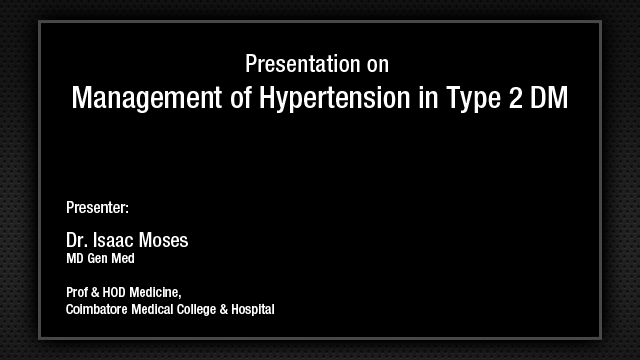 This is the topic, which was chosen because a lot of us who take the blood pressure, do not know how the thing has evolved, and today if you have to treat a patient, we have to consider so many aspects of blood pressure measurement today and Indian Guidelines on Hypertension have taken this aspect of even measurement of blood pressure in their guidelines that they have suggested. Blood pressure is characterized by large, spontaneous variations, therefore the diagnosis of hypertension should be based on multiple blood pressure measurements taken on several separate occasions. We do find clinically that so many times we find that patient will tell us that in the morning my blood pressure was alright, when my family physician had taken the blood pressure, he says your blood pressure is normal, but when you take the blood pressure, you tell him that your blood pressure is high, whom to believe and whom not to believe. It can be vice-versa also. You take the blood pressure in the evening and your blood pressure is normal, but when he goes back to his family physician, he finds that the blood pressure is high. So, there are variations and you have to be carefully before labeling a person as hypertensive and to know how these blood pressure measurements has evolved historically. Initially, there was invasive measurement of blood pressure using a simple copper cannula by Stephen Hales in the year 1773. This is way back, 2 centuries ago. In 1773, this was the first time that has been historically recorded that Stephen Hales measured the blood pressure with a simple copper cannula. Poiseuille's haemodynamometer, such a complicated instrument. This was used for measuring the blood pressure and the first model consisted simply of a column of mercury applied to the radial artery. We know how we take the blood pressure and this was the principle on which the blood pressure instruments were developed and this happened in 1834. Then, Marey's sphygmograph incorporated an accurate system of graphic recording. Earlier, it was just a recording by the person concerned, but no recording was available, but first graphic recording was done in 1860 and the apparatus of blood pressure was designed by Basch and Potain, which provided only the value of systolic blood pressure that was in 1880. Italian Mosso in 1895 conceived the device with totalized blood pressure at the extremities or the 4 fingers. We can remember how today the blood pressure instruments, which are being developed and which are being used were on on these principles of these blood pressure measurements that were being invented earlier. Riva Rocci was the first one, you know about this person, you do not know about the others, but Riva Rocci is famous. He developed an inflatable cuff combined with Korotkoff's auscultatory method in 1896. These are the instruments that one can see and the inflatable cuff that you can see, here is the inflatable cuff and the mercury column and Riva Rocci's inflatable cuff combined with Korotkoff's auscultatory method. This was the auscultatory method, which was recognized at that time and again this is how the stethoscope was put, this is what we do today also and Riva Rocci's recommendations is that when the patient has been placed in what we believe to be the possible in usual cases, the patient is sitting on the bed. When we were developing the Indian Guidelines on Hypertension, there was a lot of debate whether we should recognize lying down blood pressure or a sitting up blood pressure for measurement of blood pressure, because what do we do, how many of you take the blood pressure in a lying down position and how many of you take blood pressure in the sitting position? I think most of us have a bedside measurement of blood pressure and most of us take in the lying down position and this was a controversy while recommending the measurement of blood pressure. In usual cases, the patient is sitting on the bed, complete rest and absolute calm (we are in hurry that 20 patients waiting outside where is the calm?) are indispensable because even the slightest emotion can cause an appreciable disturbance in the level of blood pressure. This was the Riva Rocci recommendation way back in 1890. In 1920, a device for measurement of blood pressure at the temporal artery was proposed. In 1933, cervical water manometer was discovered and from 1900 to 1960 except for a few incidences in historical march of blood pressure measurement there was no other technical invention. In 1960, M. Sukolow and his Coworkers used the semi-automatic instrument to measure the blood pressure and in this was a non-invasive blood pressure measurement in 1962 developed by Hinman, Engel and Bickford, the use of portable non-invasive system of blood pressure measurement. In 1966, Bevan, Honour and Statt recorded blood pressure by direct intraarterial system, the so-called Oxford System. Then, the finger measurement was developed more recently to record blood pressure continuously by non-invasive method at the level of fingers inspired by earlier invention of Mosso and Gaertner. Then came the electronic devices. Today, the development of new instrument has been largely fashioned by the progress in electronics, which has made modern machines smaller, lighter, more accurate and reliable. 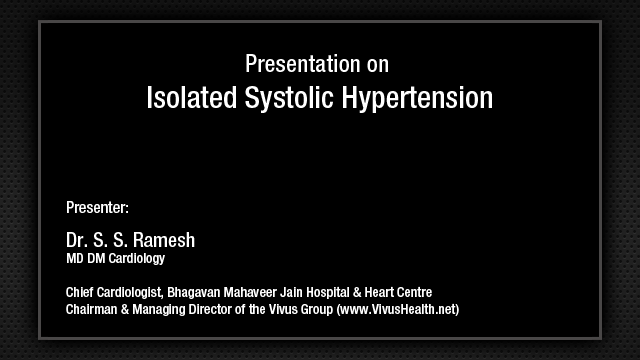 This is the special issue of JAPI, The Indian Guidelines on Hypertension III, which was released in 2013, which was supported by the Cardiology Society of India, Indian Society of Hypertension, Indian Nephrology Society, and RSSDI and The Indian Association of Diabetes, mainly The Hypertension Society Of India. This is the march of normal blood pressures that have been recommended over the years and you will see from 120/75 going down to 130/70, 140/80, somewhere some people have said 150/90 as diagnostic of blood pressure, 160, 160, 100 as late as 1913 and 1948, 180, 100 and Evans in 1956, 180/100, so we can see how science has developed as far as the measurement and the normal values of blood pressure is concerned. Now, let us see what the Indian Guidelines on Hypertension have recommended for measurement of blood pressure. Indian Guidelines on Hypertension have said that the standard mercury sphygmomanometer should be used. This was in the second guidelines and what happens in the third guidelines recommendation, I will come to very shortly. Use of a standard cuff with a bladder that is 12 cm x 35 cm, use of a large bladder for fat arms as a smaller bladder for children, the bladder should encircle and cover two-thirds of the lengths of the arm. Proper maintenance and calibration of the sphygmomanometer should be ensured whenever aneroid sphygmomanometer is used its accuracy should be checked against standard mercury sphygmomanometer at regular intervals. How many of us have changed this blood pressure instrument in the last 5 years? This has to be calibrated even if we use the same instrument because many of us do not change our instrument till that mercury column even becomes black, so these are the facts of life. This is what we are trying to inculcate in ourselves. Otherwise, what we are going to label as either hypotensive or hypertensive patients, which none of exists in an individual. For measurement, inflate the bladder quickly to a pressure of 20 mmHg, higher than the point of disappearance of the radial pulse, deflate the bladder slowly by 2 mmHg every second, ideal measurement of blood pressure. The first appearance of the sound is 1 Korotkoff is the systolic blood pressure, the disappearance of the sound, you will be thinking what am I talking, I know everything about this, but still this is the guidelines that we have given in the Indian Hypertension Guidelines. The importance of which we all realize when we take this into consideration every time we take the blood pressure. For children and in those with high output states muffling of the sound is taken as diastolic blood pressure. The following precautions are required for correct measurement of blood pressure. At the initial visit, an average of 3 readings taken at interval of 2-3 minutes should be recorded. I know it is the very difficult task in a busy OPD, but to label someone as hypertensive means you are labeling him for life. In the initial visit an average of 3 readings taken at intervals of 2-3 mins to be recorded. For confirmation of diagnosis of hypertension, record at least 3 sets of readings on different occasion except in stage III hypertension. Patient should be asked to refrain from smoking or drinking tea or coffee for at least 30 minutes before measuring BP, allow the patient to sit for at least 5 minutes in a quiet room before beginning blood pressure measurement. Measurement should be done preferably in a sitting or supine position. Patient's arm should be fully bared and supported at the level of the heart. Measure the blood pressure in both arm at the first visit and use higher of the 2 readings. In older person, aged 60 years and above, in diabetic subjects and patients on anti-hypertensive therapy, the blood pressure should be measured in supine, standing, and sitting position to detect postural hypotension. If atrial fibrillation is present, additional readings may be required to estimate the average systolic blood pressure and diastolic blood pressure. Occasionally, thigh BP has to be measured with appropriate large cuff. Especially in young person with hypertension, normally thigh systolic blood pressure is higher and diastolic blood pressure a little lower than the arm BP because of the reflected pulse wave. This is important for suspected coarctation and nonspecific aortoarteritis. I will not talk about the home blood pressure measurement, but this is very important which is going to help both the physicians and the patients for measurement of blood pressure as well as for monitoring the blood pressure and adjusting the dose of medications. This is Indian Guidelines on Hypertension - third edition, although the mercury sphygmomanometer is still the most accurate device for clinical use, is generally less practical for home use. The electronic devices when used should be periodically checked by simultaneous recording taken with the mercury sphygmomanometer. Fingers and wrist manometers are inaccurate and are not recommended. The patient should be educated not to change medications without consulting their physicians even when they are taking home blood pressure measurements. Self-measurement although ensures patient compliance due to participation carries the risk of generating greater anxiety and thereby self-modification of treatment. Ambulatory blood pressure monitoring, I will skip, because this is a subject by itself and these are the thresholds of blood pressure and this is the very important statement that has come out in the Indian Guidelines On Hypertension, third edition. In the second edition, we talked about mercury manometer, in the third edition, the health related toxic effects of mercury are recognized world over and mercury sphygmomanometers are being replaced by aneroid and digital sphygmomanometers. This is a fact. This has been recommended that we will now recommend only the aneroid and digital sphygmomanometers and mercury sphygmomanometers will be slowly withdrawn because of its toxic effect. Even in India, this is going to be the scenario in the years to come and we intend to emphasize that the change is inevitable and Indian physician should also move towards using these devices and wean off the use of mercury sphygmomanometer. 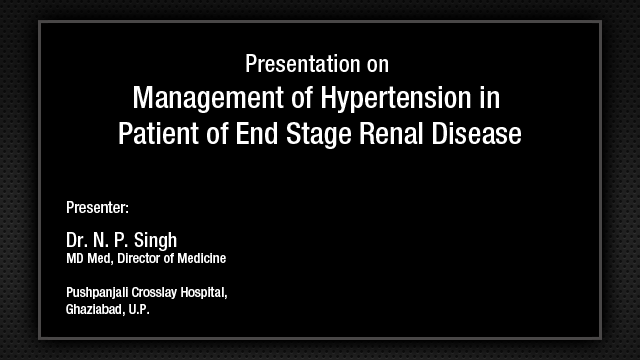 A very important statement for the Indian Guidelines of Hypertension and with this I will conclude my talk and we will go on to the next few topics. A very important message that is going to go as far as the Indian Guidelines of Hypertension is concerned is that measure the blood pressure properly, don't overdiagnose the patient of hypertension, and don't miss the diagnosis of hypertension and the very important conclusion that has been drawn is try to switch over to aneroid or other types of sphygmomanometers avoiding the use of mercury sphygmomanometer.